Sustainable construction and eco homes offer an exciting future for house building and the homes we live in. 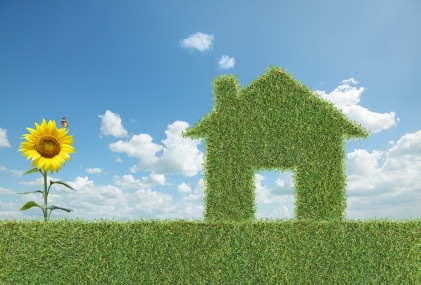 Who doesn’t love the idea of living in an environmentally efficient home, generating your own power, reducing waste and running costs, safe in the knowledge that you are doing something to help the environment? It’s a step towards the good life. Eco Homes – the way forward? On the whole, self builders have been more enthusiastic about embracing sustainable development and eco homes than commercial house builders who, understandably, have been reluctant to invest until public opinion, economics or government regulation motivate them to do so. We are all aware of the impact that human activity has had on our planet. In 2014, the Committee for Climate Change attributed 40% of the UK’s total carbon emissions to household heating and electricity (CCC Infographic). House construction and renovation is an area where we can make a huge difference! To construct an eco home, we must focus on and reduce the environmental impact of both its construction and its ongoing operation. Both can be tackled at the design phase. Let’s have a look at each in turn. An ecological assessment should be carried out to allow the development of a house design and construction plan that reduces its impact. It is even possible to create new habitats in the form of green or living roofs. The sustainability of the raw materials used. The lifespan of the material. Its performance characteristics as part of the building fabric. The acquisition of raw materials. The possibility for re-use or recyclability at the end of life. The BRE’s Green Guide is another excellent resource for assessing and choosing building materials and components from a low impact environmental perspective. Material specific organisations like the Forest Stewardship Council (FSC) only certify timber taken from responsibly managed sources. You can find suppliers who use environmental management systems (EMS) to maximise the environmental efficiency of their businesses. EMS accreditation can be awarded through British Standards (BS) and the International Organisation for Standardisation (ISO). Start off by discussing the options with your designer . He or she should have a good working knowledge of the materials and suppliers available. They may even suggest incorporating some recycled or green building materials into the design. Perhaps the most significant decision you will make is in the choice of house construction method. This constitutes a large portion of your material needs and each method has different implications both in construction and operation. Have a look at the options. Efficient and responsible site management practices are essential to limit energy and water use during construction and to manage waste materials. You can find environmentally considerate builders through EMS certification or the ‘Considerate Constructors Scheme’, which encourages environmentally considerate construction practices. High standards of workmanship also ensure that the finished structure meets its intended design performance. The modern methods of construction are designed to increase off-site manufacture, thus improving the efficiency of the processes involved. The second requirement of an eco home is efficiency in its everyday operation. Again, these issues should be addressed early on and incorporated into the house design. We use energy for our day-to-day power needs. These include space and water heating, cooling, ventilation, lighting, and powering appliances. In order to improve eco home credentials, we need to reduce the amount of energy use from non-renewable sources and replace it with energy generated from renewable ones. Using a green energy supplier. The Micro-generation (on site) options have the additional advantage that any surplus energy produced can be sold back to the national grid. Improving air-tightness and controlling ventilation. Installing efficient heating and ventilation systems. Reduced flow and aerated taps. By considering waste management at the design stage, you can incorporate facilities into the design to help with managing waste, recycling and composting, leading to a reduction in the amount of waste going to landfill. If you are interested in building an eco home then your first port of call is your designer. If you are really serious, then you should consider contacting a specialist eco home designer. Following the discontinuation of the Government’s ‘Code for Sustainable Homes’ scheme in 2015, some of the standards were consolidated into the Building Regulations. BRE – who had developed and managed the standards of the code for the Government, subsequently launched a new Home Quality Mark scheme for the UK. This provides a national standard rating system for new homes. The aim is to raise standards of design, construction, cost effectiveness, occupant wellbeing and environmental impact. For more information on finding land, design, management and the financial aspects of self building have a look through The Self Build Guide.